Media voters appear to be coming around to UAE (G2) winner Mendelssohn, the only 3-year-old to move up in the latest NTRA Top 3-Year-Old Poll just 12 days out from the May 5 Kentucky Derby Presented by Woodford Reserve (G1). With the final prep races run two weekends ago, this week’s rankings were determined without any new race results and could foreshadow which likely Derby entrants will garner the most support from horseplayers when betting opens. The increased support for Mendelssohn (11 first-place votes; 276 points overall) elevated him into fourth on the poll, overtaking Blue Grass Stakes (G2) winner and last year’s Champion 2-Year-Old Good Magic (2; 264). The rest of the top 10 was unchanged from the previous week, with Justify (18; 346) the far-and-away favorite, followed by Magnum Moon (2; 284), Audible (5; 283), Mendelssohn, Good Magic, Bolt d’Oro (245), Vino Rosso (1; 131); Noble Indy (96); My Boy Jack (51); and Enticed (43). The NTRA Top 3-Year-Old Poll is the sport’s most comprehensive survey of experts ranking the generation of Thoroughbreds that includes all Triple Crown contenders. Every week eligible journalists and broadcasters cast votes for their top 10 horses, with points awarded on a 10-9-8-7-6-5-4-3-2-1 basis. The Top 3-Year-Old Poll concludes June 11, after the Belmont Stakes. In the NTRA Top Thoroughbred Poll for horses of all ages, the top nine was unchanged following a week with little consequential racing at the highest level. Abel Tasman snuck into the 10th spot as last year’s Champion 3-Year-Old Female continues to work toward a 4-year-old debut in the La Troienne (G1) on Kentucky Oaks Day, May 4. 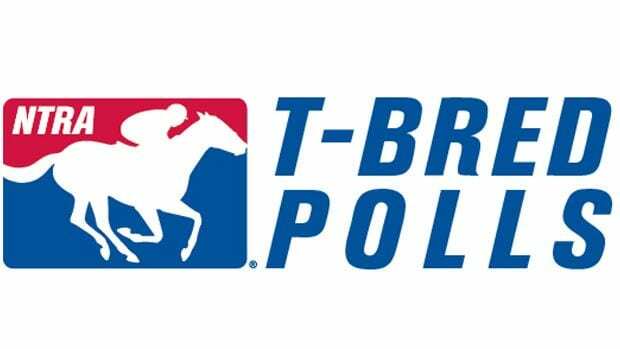 The NTRA Top Thoroughbred Poll concludes November 5 after the Breeders’ Cup.